The Best Speedway Team - Ever? When your reserves achieve a combined league average over over 15.50 CMA, you know you must have an absolutely awesome team. At the end of the league campaign - where we were beaten just twice in 28 matches - the combined team average for this magnificent seven was almost 62.00 points; a figure that would make most current promoters weep. Erik Gundersen led the way in the first post-Penhall season, proving himself as a completely worthy Number One. 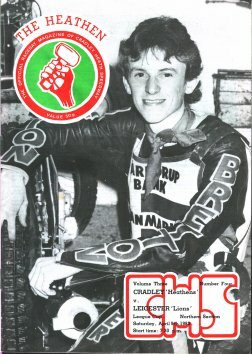 Missing from the 1982 squad were Bruce Penhall who had signed an eight year contract with M.G.M. film studios, Jan Verner was refused a work permit by the Speedway Control Board and Andy Reid who returned to Glasgow. front row Peter Ravn, Jan O Pedersen, Alan Grahame. Three English internationals stocked the top five: Simon Wigg, Alan Grahame & Phil Collins, along with the new American heart throb and latest young superstar, Lance King. At reserve were two Danes which some teams would have welcomed as heatleaders, Peter Ravn & future World Champ Jan O Pedersen. 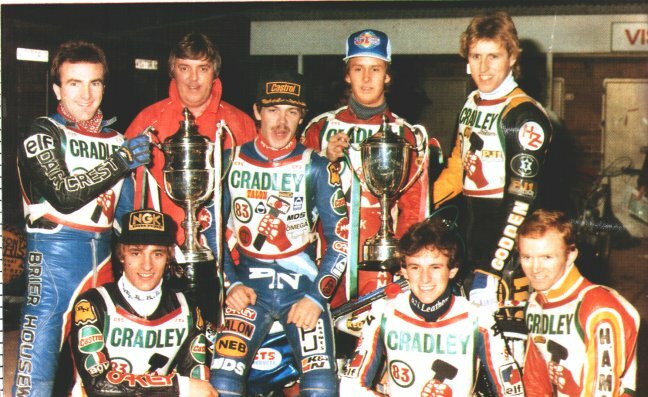 On this evidence alone, its certainly far from unreasonable to argue that this 1983 Heathens septet was quite possibly the best speedway team ever. Cradley win the Cup 96-60 on aggregate. The annual Golden Hammer was won by Lance King.